I’ve never been one to wash my hair everyday, and to be completely honest, I find second day hair a lot easier to work with. Hairstyles for unwashed hair are plentiful since many hair tools and hairstyles work better on hair that hasn’t been just-washed. Sure, freshly washed locks can look gorgeous, but when it comes to working with and styling your hair, it’s easier come day two. Most hair professionals recommend washing your hair every three to four days, as over-washing it can actually make it more oily. Keep in mind, the idea isn’t to get to a point where your hair looks greasy and lifeless. The best hair is settled and lived in. Natural oils make it easier to sculpt and shape hair, while clean hair is often slippery to work with, requiring more product. If you want to know how to style your second day tresses, here are 10 easy hair hacks for gorgeous locks! Dry Shampoo is heaven sent. It’s a lifesaver for second day hair, and with it you can get perfect hairstyles to hide greasy hair! All you need to do is give your roots a little spray, rub it in and brush it through. While it doesn’t actually clean your hair, it absorbs the oils that make your hair look greasy, transforming it to look just-washed! My favorite dry shampoo is Batiste. It smells good and gets the job done without any unwanted residue. Whenever I notice my hair looking a little “lived in” the day after a wash, I’ll often throw it up into a ponytail. It tends to look cleaner, and it’s a hairstyle that I love to rock! Especially on busy days where you don’t have time to create another hairstyle, ponytails can be your saving grace! And if you love the slicked back, shiny ponytail look, add a touch of non-greasy hair serum (I swear by Garnier Sleek and Shine Anti-Frizz Serum) before styling it to add gloss and shine! Curling irons often work better on second day hair, rather than when you hair is just-cleaned. “Dirty hair” tends to have a better hold with heated tools, due to the natural oils and textures created by sleeping on it. Since your hair is easier to control on the second day (due to natural oils that add texture and waves), braided hairstyles are one of the best no wash hairstyles you can do. Add some dry texture spray (Boldify Dry Texturing Spray is a great one!) and create a gorgeous, textured braid. A day after you wash your hair, textured waves are always a good call. Add texturizing spray through your strands, scrunch and tossle it. It works as a mild dry shampoo, adding texture and volume, and will also hold better with lived-in locks. If you’re looking for some second day hair products to add to your arsenal, here are 7 we simply cannot live without! In this tutorial, you get not 1, not 2, but 10 second day hairstyles! Each of these hairstyles is super quick and easy, so they’re perfect when you don’t have much time in the morning. From a front side braid, to a headband updo, and a half-up braided top knot, you’ll love these simple heatless hairstyles! If you want something simple and have a little more time in the morning, this tutorial shows you how to make your hair look refreshed. She curls her hair with the GHD classic curl iron to get gorgeous waves that will last all day. It’s a style you’ll want to do over and over for your second day tresses. From a barrel roll bun to a swirly twirly ‘do, these dirty hairstyles will only take you a few minutes, but leave you looking amazing and ready for the day ahead. She uses the Aveda Shampure dry shampoo to give life and texture to her hair and help her get these pretty looks. 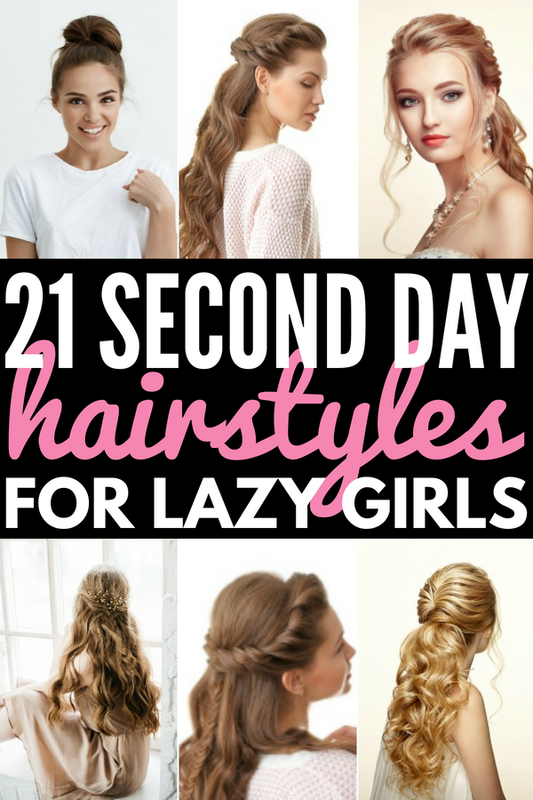 These second day hairstyles are easy to do and will make you look gorgeous! They don’t require any heat (unless you want them to – you can always straighten or curl them too!). She uses the Batiste dry shampoo to help her achieve the hair styles and get that clean look for second day hair. These hairstyles are perfect for hectic mornings when you don’t have much time. They’re super simple and will work with your hair rather than against it. From double braided buns to a half-up teased bun, to a boho wrap, create these hairstyles for a lovely look even when you’re running late. The only product she uses is a hairspray to hold her looks in place. These second day hair hacks are ideal for anyone who wants a quick ‘do on a hectic morning. Try these second day hairstyles for gresh, gorgeous locks! 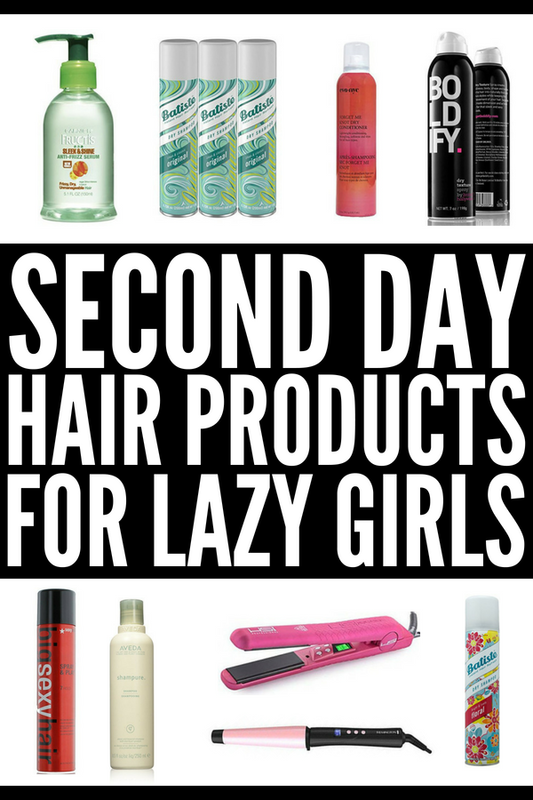 If you loved these second day hair hacks, please share this post on Pinterest! And if you want more hair tips and tricks, please follow our Beauty board on Pinterest!